The Yankees might actually be a good team after all. They come into the Bronx this weekend taking both games against the Boston Red Sox. They were heavy underdogs in that series but only gave up one run. They have the best ERA in baseball and Masahiro Tanaka reinstalled himself as the ace of this staff. He threw a complete game shutout last night, completely shutting down the Red Sox offense. The Yankees were able to get enough runs against the Red Sox ace Chris Sale to win the game. On Wednesday night, Luis Severino showed why still belongs in this rotation, throwing up 7 shutout innings. Aaron Judge, Starlin Castro, and Chase Headley are carrying the offense right now, they are among the best hitters in all of MLB. The Yankees have a great offense right now and it will get even better in the next couple of weeks. Didi returns from DL tonight and Gary Sanchez will begin his rehab process next week hoping to be back in the majors in the next couple of weeks. As I said in the preseason preview, Didi has a chance to be a great All Star shortstop, he will not make it there this year, but can still contribute to the Yankees offense. 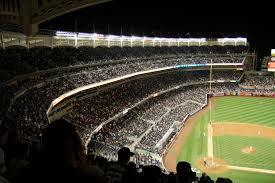 The Yankees will take on the Baltimore Orioles in a three game set this weekend in the Bronx. Baltimore leads the Yankees by one game in the standings. The two teams met earlier this year, that was the series where the Yankees turned around their season. The winner of this series will be in first place on May 1st, highly over achieving on expectations for both teams. The Yankees will send Sabathia, Pineda, and Montgomery this weekend. The Yankees will take two out of the three and go into May with being tied for first place, something I thought was never going to be possible this season.